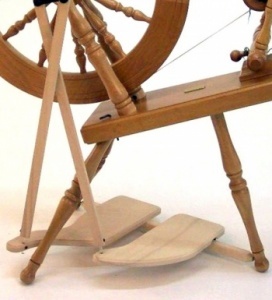 Change your single treadle Elizabeth wheels to double treadle. Using both feet doubles the energy and encourages the spinner to sit directly in front of the wheel, which is good for the body posture and balance. The cranks are offset 10 degrees so you can start the wheel in either direction without using your hands. The kit includes a new crank and conrod joints. This kit will fit all Elizabeth wheels made after 1971.